We struck out in two cars from Kenmare early on a frosty, November morning and climbed over a sleepy Molls Gap and down into the Owenreagh valley. We left one car on the crossroads at V 83994 78630 A and drove up the valley to V 80532 77882 B where there is a layby on the right with room for two cars. On with the gear and up the tarred road to V 80608 78026 C where we stopped for a moment to take in the snow covered ridge up to Mullaghanattin before hopping the wire and starting the climb up to point 568 mtrs. After the tremendous view of Stumpa Duloigh we headed on to Knocknabreeda. It may be small in stature but what views from the summit. All around is the evidance of the unstoppable power of glaciation. 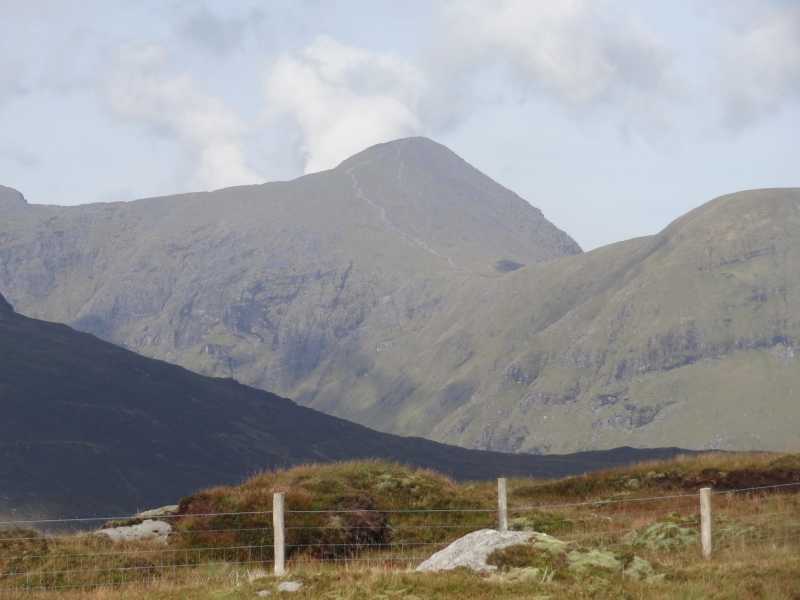 Rocks of green sandstone and siltstone with lenses of conglomerate quatrz and red jasper scoured and flattened by an ice cap centered on the Kenmare area as it forced its way northwards between Purple mountain and the Reeks cutting the deep col of the Gap of Dunloe. As the Ice moved it dragged loose shattered stones across the surface of the underlying rock and embedded some of these as which can now be seen as rounded pebbles in the rocks surfaces. Larger rocks or Erratics (non native rocks) were deposited randomly about the area. As we walked several examples of red sandstone erratics were to be seen. Geology can only say so much and I guess not everyone gets excited by old stones(pardon me). Picture from hivisibility : View on Carrauntoohil from Knocknabreeda summit. 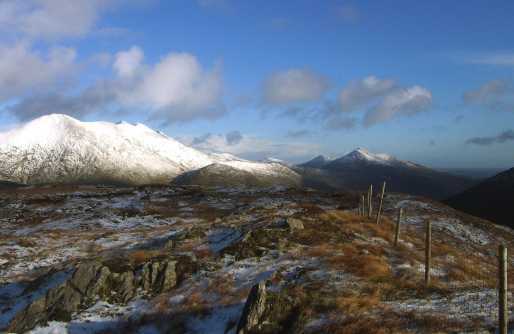 Picture: View on Carrauntoohil from Knocknabreeda summit. 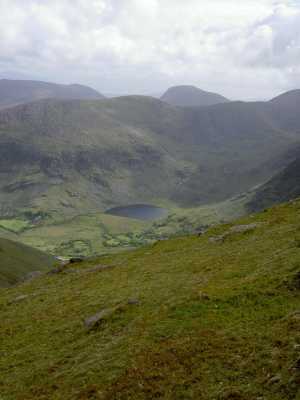 View of Carrauntoohil from the summit.